Clarence Darrow once said, "History repeats itself; that's one of the things wrong with history." If people are to learn from history, the information-packed Foundations of Freedom™ provides a great starting point. 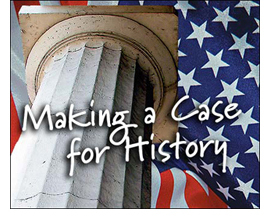 In this DVD-ROM curriculum supplement students study fundamental issues arising from the 200-plus year history of the U.S. Constitution. The DVD-ROM uses case studies to immerse learners in various constitutional challenges and themes. Through multimedia, learners tackle such fundamental issues as popular sovereignty, freedom of speech, and judicial review. Foundations of Freedom is part of an initiative of U.S. Sen. Robert C. Byrd to restore history to its rightful place in America's schools. Contact us to visit Foundations of Freedom. Foundations of Freedom was funded by the U.S. Department of Education. The contents of Foundations of Freedom and this web site do not necessarily represent the policy of the Department of Education, and you should not assume endorsement by the federal government.